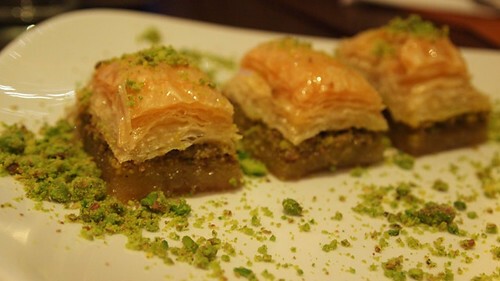 Islington isn’t the first place that comes to mind when talk turns to Turkish food. All that glistening grilled meat and multi-dish meze spreads is far more Dalston and Green Lanes, a natural habitat for great Anatolian food. The N1 scene, such as it is, was dominated by the busy Gallipoli boys, all dancing on tables and tasty apple tea. But food that hardly sets my taste buds alight. So there was excitement when I saw Antepliler, one of Green Lanes’ best, open an upmarket joint on Upper Street. The place is named after Antep, an area of SE Turkey famous for its kebabs, baklava and, if this place is anything to go by, pide – a type of Turkish pizza . Because frankly, the Lahmacun pide they serve here is better than most Italian pizza I’ve eaten. A paper thin crust baked to crispy perfection and topped a herby and aromatic minced lamb. The aromas rising from it were enough to set my tummy a-rumbling. And that was after the world’s biggest lunch. Superb. The hummus was another highlight. A smooth and gently spiced delight both light and filling. There was none of that cloying tang that laces the commercially produced stuff. This home made version came topped with succulent grilled strips of lamb and a fruity olive oil. The flat bread that came with it was soft, airy and had obviously just been made. And the chilli sauce – also freshly made – was a revelation. Fruity and textured with a decent bite to it. I would have been happy scooping it in by the spoonful. Stuffed vegetables were good, with dolma that actually tasted of something. Hellim cheese was grilled not fried and wonderfully squeaky (a good thing). But the Borek – cheese stuffed pastries rolled like cigars – were all mouth and no trousers. A real shame. Mains were decently grilled meats and fresh tasty vegetables. And while they were well cooked, with a tasty charred exterior and good quality meat, next to the Lahmacun and hummus they just kinda faded into a blur. A lot better than most on Upper St though. Baklava however, was a great end to the meal. The restaurant have obviously recruited some Antep expertise, because these were superb.Treading that fine line between too sickly sweet and over dry with aplomb, these babies were beautiful. Nutty, honeyed pastries with a delightful crunchy bite. The service though was weirdly hit and miss. Varying from the over solicitous at the start to pretty much non-existent at the end. Our empty be-crumbed plates were left on the table for over 30 minutes before being cleared and dessert offered. It took another 15 to get the bill. Bizarre considering there were two staff and only three tables eating. If they can sort this out then this should be a success, because the food is pretty good. 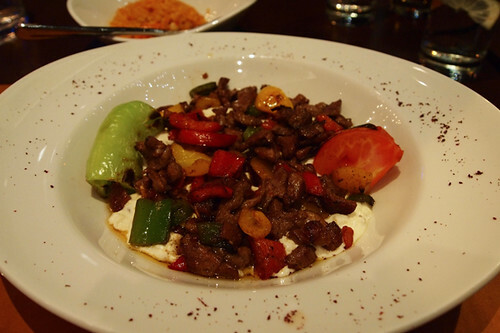 For more on Antepliler check out Hungry in London’s blog. The meal was pretty reasonable with meze plates and Lahmacun being between £3.50 and £5 each and main around £10-£12. 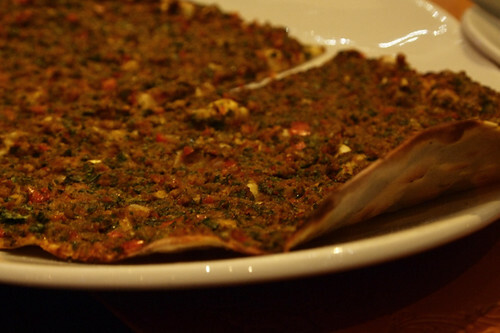 The lahmacun from Antepliler are next level, I agree. Have you ever had a takeout one, straight from the oven on Green Lanes, stuffed with salad and wrapped in newspaper? After a few visits to the Upper Street branch I still don’t think it matches the quality of the Green Lanes one. And it has nowhere near the atmosphere. Can’t quite put my finger on it, but no great shame as my house is perfectly pitched between the two, anyway. You cruel cruel man. There is nothing I could do with more now than a good Turkish meal. Looks pretty impressive for a branch restaurant – you need to hit the original some time though! @Jess – i haven’t, but I think I should – the more I hear about their Lahmacun the more I want to go there and try them. I think Green Lanes probably does some of the best Turkish around, even more than Dalston (or so I hear). @TomEats – heh, revenge for all those lovely lovely posts on HK food. It definitely sounds like it’s more a restaurant, more ‘Upper Street’ than it’s siblings, but I need to go visit to find out for sure. I think I would go for the hommus alone – it looks great! 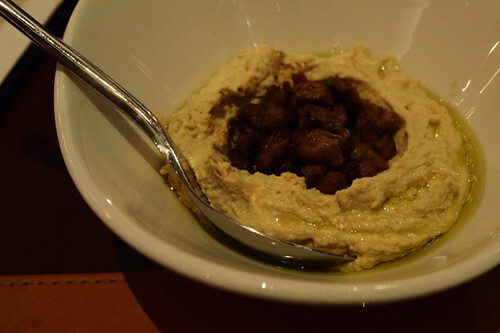 @Gourmet Chick – It was the best Hummus I think I’ve had at a restaurant, only Mangal has come close. Most of the rest just isn’t as good, and a criminal amount is very obviously shop-bought. Love the Lahmacun here and the lamb shish is also to to die for. The Borek is really lovely too. I love the food here. I don’t care about the service – I come for the food. @Aaron I’m biased, but I definitely agree. What with Hala as well (which I actually think wins best ‘all rounder’ resto for their amazing mixed grill and gozleme) and the cafes where the guys let you sit and drink tea for hours then don’t let you pay… Green Lanes is one of my favourite places in all London. The bakery Yasar Halim is next level great too (although I think that might actually be Cypriot). @Jess – I’ll have to try out Hala as well – I really need to get me and my Turkish food loving appetite up to Green Lanes, it’s been a while since I last ate up that way. It all just sounds so good! Everything looks so delicious! What a feast! I’ve been meaning to check out the Islington branch for a while now. Agree that the green Lanes one is outstanding – I went about 6 months ago, have kept my bill ever since, meaning to write a wee review but never got round to it! The lahmacun was indeed stupendous, pide less so. There were a couple of pretty spectacular domestics happening around us but nobody batted an eyelid. One of the best meals I’ve had in Londno, the real deal. And Jess – yes yes YES to Yasar Halim, baklava to maim for. How do you think the Islington branch compares to the original Green Lanes one? A bit more middle class/sterile presumably? @Eoghan – I really need to get myself to the Green Lanes branch. My gut instinct is that it will be a little more frantic, a little more fun. This is very much catering to the Islington crowd.